It is summer and the holidays are coming up. This means lots of parties, friends, many beautiful presents and glitter eyeshadow. In holidays, glitter eyeshadow is simply a must-have, something like red lipstick but much more fun. But most of us know that if you are not very careful, it is pretty easy for nice glitter beauty looks to become poor. So we visited Diane Kendal, makeup artist at Lancôme, and she showed us a couple of tricks for how to apply glitter eyeshadow for everyday look (and avoid looking like a disco ball while wearing it). Follow this tip to reduce mess. Kendal explained that you should always dip your brush in water before dipping it in the glitter. This will prevent anything from falling onto the rest of your face. She suggested that if you want to prevent any problem, you should put a handkerchief below your eyes when applying the makeup. You should keep the rest of your face low-key. We all know that glitter eyes are a major look, so it is very important to prevent the rest of your makeup from contesting. Kendal said that the best look for her is lip balm on the lips, a pale pink blush (such as Lancôme Blush Subtil in Cedar Rose on the cheeks and not much makup on the rest of the face. This is not time for big-time eyeliner and extremely matte statement lips. You should accentuate your eyeshadow while you glow and sparkle. 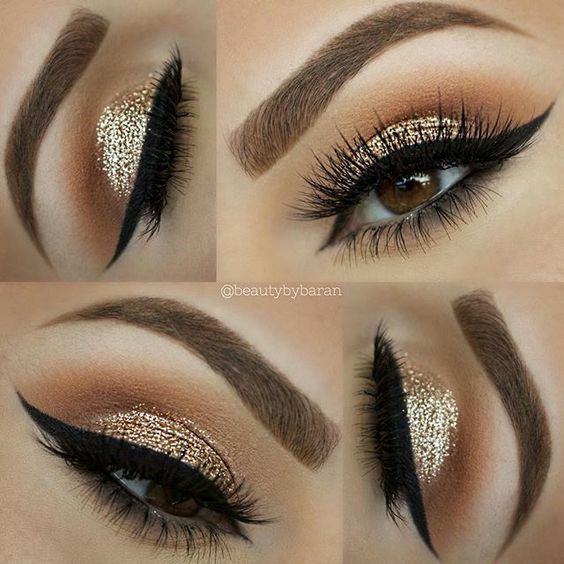 You should keep glitter limited to one area on your eye. Kendal said that she used a smudgy brown as a boundary for the glitter. She explained that you should keep it near the centre in order that the sparkle doesn’t hide your eye – when your eyes are open you only get a hint of it. She also explained that you should not apply sparkles on the corners of your eyes and your brow bone, because they can look too extreme.